The Globe Theatre Heavens was the name given for the false ceiling over the stage. The 'Heavens' provided shelter for the actors and their costumes during inclement weather. The heavens were also referred to as the 'Shadow' due to the large shadow it cast over the audience in the yard or pit. The false stage ceiling was supported by two large ' Herculean ' columns (pillars) made of huge, single tree trunks, elaborately painted to resemble marble. 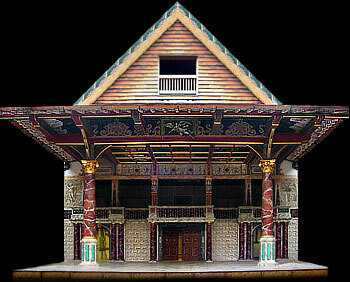 The architecture of the Globe theatre was deliberately designed to reflect easily recognisable elements of Roman or Greek architecture thus elevating the bad reputation of plays and actors to the much admired Greek or Roman classical plays. The above picture of the new Globe Theatre stage illustrates the pillars and the heavens. The false ceiling provided the opportunity to stage some exciting special effects. The false ceiling was designed with trap doors. Through the trap doors actors, attached by a harness with wires or ropes, could make flying entrances on to the stage. To add to the effect these wires could be concealed beneath the actor's costume. Other unusual special effects could be made from the heavens including different sounds. Musical instruments such as the trumpet, or drums. Actors skilled in imitating the baying of hounds and crowing of roosters or the wailing of ghostly sounds. Even the sound of thunder could be improvised from the heavens. Another prop which could have been used by the Globe Theatre was flowers. Flower petals might have been dropped from the heavens at the end of a play where a happy occasion or celebratory procession ended the play. What did the Globe Theatre Heavens look like? It was a false ceiling supported by two huge pillars. No detailed description of the heavens in the original Globe Theatre has survived - fragments from letters and Shakespeare's own words have provided clues. However, the ceiling was believed to be elaborately painted to depict the heavens - hence its name. The theme of the heavens fitted well with the classical concept of the Globe, designed to give the theatre an air of respectability. Conversely This was taken from the term 'hell mouth' which was used to refer to any trap-door in the bottom of a stage (called the cellerage). Interesting Facts and information about the Globe Theatre Heavens. Additional details, facts and information about the Globe Theatre can be accessed via the Globe Theatre Sitemap.